Follow the yearly cycle of 12 full moons to learn about the lives of the early Algonquian people. Have your class perform a play based on a Native American folktale. Help students create Native American jewelry, clothing, and other crafts. Learn about the dwellings and the lives of the earliest inhabitants of the eastern woodlands of North America. Education World recommends four new books that help youngsters develop their knowledge of and appreciation for the legacy of Native Americans. The earliest inhabitants of North America enjoyed a strong relationship with the natural world, close-knit social structures, and a vibrant mythology that has largely been forgotten or relegated to occasional mention in history texts. To help you enliven lessons celebrating Native American history, heritage, and culture, Education World recommends four new books geared toward children ages nine through 12 that take a variety of approaches. Engage your students in Native American life through crafts or plays or a study of a pattern of life based on each month's full moon or how people built their houses. 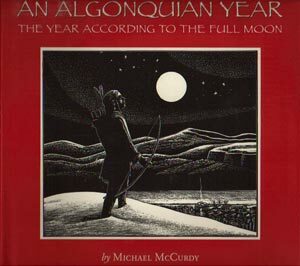 In An Algonquian Year: The Year According to the Full Moon (Houghton Mifflin Company), acclaimed author and illustrator Michael McCurdy follows the cycles of the year according to the Algonquian moon names. With a concentration on daily life, McCurdy effectively demonstrates the great role nature and the changing seasons played in the lives of Native Americans in pre-colonial times. The Algonquian people named each full moon of the year: During the month of January, the moon was the "Hard Times Moon," the name coming from the harshness of the winter season in present-day northeastern Canada and the United States. April's full moon was the "Spearfish Moon," because the plentiful fish of the rivers and lakes allowed for easy spear fishing. McCurdy's introduction explains the background of the Algonquian people -- a group of Native American tribes loosely related by shared linguistic characteristics and mythology and encompassing many different tribes, including the Micmac, the Abenaki, the Pequot, the Ojibwa, and the Arapaho. He then proceeds to describe each month in terms of what it meant to the Algonquians. Each month has a two-page spread, with one page a black-and-white scratch board illustration. The artwork is stunning and highly detailed, highlighting the human element in each nature scene. The right page describes the Algonquian activities for that particular month. For June, the "Strawberry Moon," for example, McCurdy tells about the Algonquians' love of wild strawberries and that the job of harvesting them fell to the old women and the children. An Algonquian Year: The Year According to the Full Moon is an appealing book, both for its artwork and its look at a way of life more dependent on the changing seasons and the natural world than that in which we now live. You could use the book's monthly chapters to enliven a yearlong classroom project on Native American life, or use the book as a springboard, perhaps letting individual students or teams of students each take a different month, for further investigation into the daily lives of early Native American tribes. A hero outsmarts Old Man Winter, ensuring that spring will return every year. Possum's vanity causes him to lose his beautiful tail. A cannibal monster is destroyed, but in burning his body, mosquitoes are brought into being. 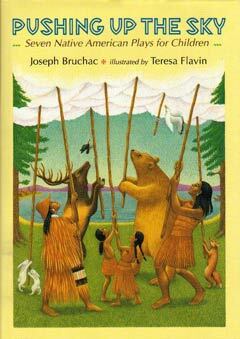 Those traditional Native American folktales, along with four others, are adapted into plays -- appropriate for production by children of elementary school age -- in Pushing Up the Sky: Seven Native American Plays for Children (Dial Books for Young Readers), written by Joseph Bruchac and illustrated by Teresa Flavin. In the introduction for each play, Bruchac provides a brief description of the tribe from which the folktale originated. He covers a good representative mix of native cultures, including the Abenaki of northern New England, the Cheyenne of the Great Plains, the Tlingit in the Far North along the Alaskan coast, and the Zuni of the Southwest. Illustrator Teresa Flavins provides both full-color and pen-and-ink artwork that effectively captures the folktales, making them easy for young thespians to visualize. The text describes everything needed to stage a production of each play: the cast of characters, suggestions for props and scenery, and ideas on how to easily create the necessary costumes. Bruchac is mindful of the needs, restrictions, and abilities of children. Speaking parts are generally limited to ten or fewer, making most of the plays doable for small groups, but he includes suggestions for adding non-speaking parts to can stretch the cast to include an entire class. By helping bring to life Native American culture, as well as providing seven short, easily-producible children's plays, Pushing Up the Sky: Seven Native American Plays for Children is a natural choice for elementary school classrooms. 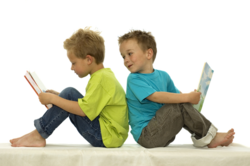 The publisher grants performance and photocopying rights for the plays to be performed by children for school and home audiences so long as no admittance fees are charged and videotaping is limited to use in the classroom. 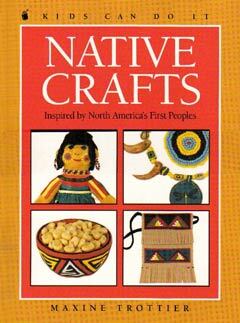 For a useful, hands-on supplement to the study of Native American history and culture, take a look at Native Crafts: Inspired by North America's First Peoples (Kids Can Press), written by Maxine Trottier and illustrated by Esperana Melo. Geared toward children ranging from about nine to 12 years of age, this collection of 16 crafts projects will give youngsters an appreciation of the beauty, utility, and ingenuity of Native American crafts. With instructions for projects as diverse as pottery, jewelry, and ceremonial items, Trottier emphasizes the use of natural materials and nature-inspired designs. Each two-page spread presents one project. An introductory paragraph provides some background on the object and its use, as well as whether a specific tribe or culture used it. Melo's illustrations, including full-color renderings of the finished projects, enhance the materials lists and clear, simple instructions. Most of the projects, which vary in difficulty and time, require some adult supervision for elementary school students. In her introduction, Trottier speaks generally about Native Americans' use of natural materials and motifs based on designs found in the natural world. A map of North America follows, color-keyed to show the traditional territories and some of the Native American tribes associated with each area. The map, easy-to-follow instructions, detailed illustrations, and range of projects make Native Crafts: Inspired by North America's First Peoples a helpful and enjoyable addition to the study of Native Americans. Before white men came to America, deep forests covered most of the northeastern part of the land. Woodlands stretched from the Atlantic Ocean across the Appalachian Mountains to the Mississippi River Valley and from Newfoundland and southern Canada to Virginia and North Carolina. Rising columns of smoke from campfires marked the villages of lodges huddled near winding rivers or clear lakes. The people who lived in these villages were strong and tall. Their average height was greater than that of most Europeans at the time of their first encounter. They had dark eyes and dark, straight hair. Over countless generations, they had observed and studied their surroundings. The people developed a system that enabled them to grow crops successfully and to take advantage of the myriad of resources as they became available. 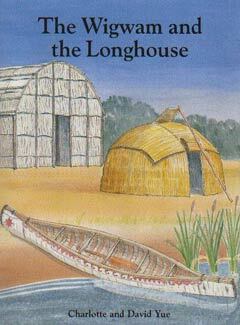 The Wigwam and the Longhouse (Houghton Mifflin Company), written and illustrated by Charlotte and David Yue, chronicles with great detail and clarity the daily lives of the native peoples of the American woodlands. The book covers a lot of information: a description of the woodlands, the different types of homes, the social structure of the native tribes, and the daily and seasonal rhythms of life. Readers will gain insight into a way of life that all but disappeared long ago. In learning about the construction methods for various types of shelter, readers will be impressed with the talent and ingenuity of those early Americans. Woodland people built wigwams from readily available saplings and could easily disassemble them and move them to a different campsite. (Most of the woodland people lived in more than one site during the year.) Longhouses were year-round communal homes that housed many families and could be as large as 200 feet by 30 feet. In addition to the discussion of the homes of the woodland tribes, the Yues also discuss other aspects of their lives. They devote one chapter to the political organization of the tribe, touching upon the importance of women and elders in the power structure. The Yues also discuss the displacement of the native people by European settlers and ways in which, even today, the descendents of the original woodland dwellers try to keep something of the old culture alive.